There are countless varieties of citrus fruits available around here. We've already examined the endlessly-useful lime, and its cousin, the cleverly-disguised Bahían orange. A few days ago we asked at a fruit stand for a sweet orange, and were handed one that was apparently a cross between two other oranges (conveniently available in the adjacent bins). Forgive me, I have no idea what the names of any of these are, but presumably they all contain the word laranja (the Portuguese of -- sing it with me! -- orange). The hybrid orange was indeed the sweetest either of us had ever tasted, without even the slightest hint of tang. It was like eating orange sherbet. 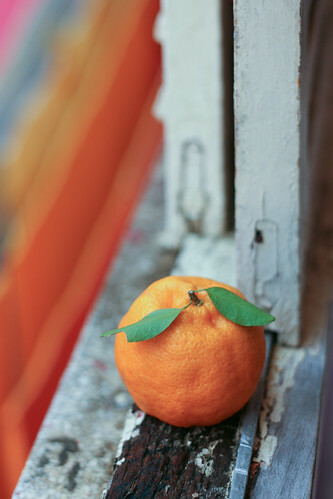 Today we have yet another citrus variety, a fruit that is undoubtedly more recognizable than yesterday's. At the grocery store, it was labeled pokan tangerine, but Google suggests that it also goes by ponkan tangerine. It could also be that pokan is Portuguese for ponkan. No matter, really. The bottom line is, I can't resist buying a fruit that still has its leaves attached. Look at that guy. He's all jaunty. 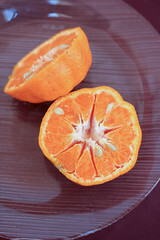 The ponkan tangerine is squishy, and its skin is a little loose. The loose skin makes it really easy to peel, which I value in a citrus fruit. The cross-section is good and orangey, both in colour and flavour. It tastes juicy and sweet. The best thing about it, though, might be its smell, which currently indicates that I need to wrap this up so I can eat the little guy without getting my keyboard all juicy.